This is one of the earliest and most interesting takes on the comparative heights of principal mountains theme by John Thomson. Comparative mountains charts first appeared in the late 18th and early 19th century. 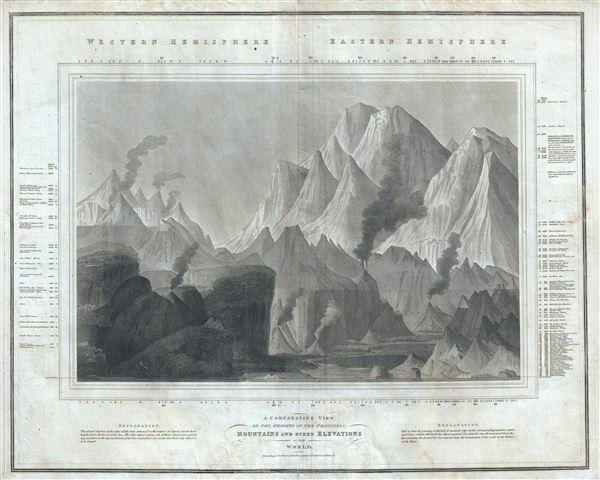 Initially these charts focused on Europe or even signal countries, but by the early 19th century the explorations of the world's great peaks had reached a point where such a chart could be composed on a global level. John Thompson, the preeminent Scottish cartographer of the period, introduced this chart, one of the first and most interesting of the genre. Covering both the eastern and western hemispheres, this chart shows not only the heights of mountains, but also compares them to important buildings, cities, vegetation limits, and even fauna. Thompson divides his map in to the western hemisphere, on the left, and the eastern hemisphere on the right. In the Western Hemisphere, he identifies the Ecuadorian peak of Chimborazo at the highest mountains - the great Chilean peaks had not yet been discovered. Just below the summit of Chimborazo, a tiny speck represents a rare Andean Condor in flight with a highest altitude of 21,000 feet. About halfway down on the left side of Chimborazo, another little speck, this time in the shape of a man, indicated the highest elevation attained by the naturalist Alexander von Humboldt. Also identified are various high evolution towns and cities including Mexico City, Lake Toluca, Quito, and Caracas, among others. On the right hand side of Thompson's map chart, the behemoths of the Eastern Hemisphere dwarf the mountains of the west. Here, Nepal's Dhaulagiri, 27,677 feet, is identified as the world's greatest mountain. Everest and many of the other great Himalayan peaks had not yet been discovered - today we know that Dhaulagiri, though certainly a mighty peak, is only 8th. Engraved by the firm of W. and D. Lizars for John Thomson's 1817 edition of Thomson's New General Atlas. Very good. Minor wear and toning along original centerfold. Original platemark visible. Some offsetting and toning throughout. Bottom margin exhibits some wear, especially near centerfold.